A powerful performance - A next-generation APS-C sensor produces photos packed with amazing detail, even in bright highlights and dark shadows. Be creative with movies too - Shoot superb Full HD movies, with dynamic reproduction of motion at 60 fps and cinematic shallow focus effects. 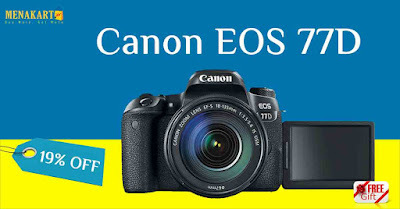 Take charge of your photography - When you pick up the EOS 77D, features like its rear control wheel and Vari-angle touchscreen give you more control and creative freedom. Share your imagination with the world - A combination of Wi-Fi, Bluetooth and NFC wireless technologies make connecting with compatible iOS and Android smart devices easier than ever.